As I write this it’s after 1am and news has just broken that Satoru Iwata has passed away, so please forgive me if this isn’t articulate or is a little more rambling than usual. 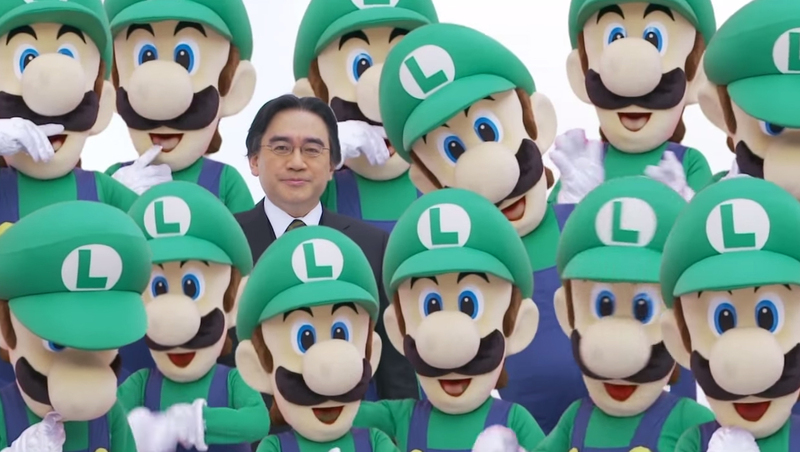 Satoru Iwata was a man who embodied everything Nintendo stood for. He was a man who put fun before finances, entertainment before enterprise, smiles before sales. Before he became the first President of Nintendo who wasn’t part of the Yamauchi family, Iwata was a programmer. He was a developer first and a businessman second. It was this inherent love for gaming, this passion that he took with him right to the tragically early end of his life, that made Iwata the perfect man to lead Nintendo. It’s no secret that Nintendo’s finances haven’t been great of late. But it’s a testament to Iwata that despite this he continued to receive sterling approval ratings from the company’s many shareholders. This was a man who was not afraid to take risks and try something new. This was the man in charge when the decision was made to favour innovation over power and introduce the DS to the world, at a time when people were convinced the far more impressive Sony PSP would destroy it. 151 million DS sales later, he was proved right. This was the man in charge when history repeated itself with the release of the Wii, an underpowered system that once again focused more on offering something new than something graphically impressive. Its codename, Revolution, couldn’t have been more appropriate. 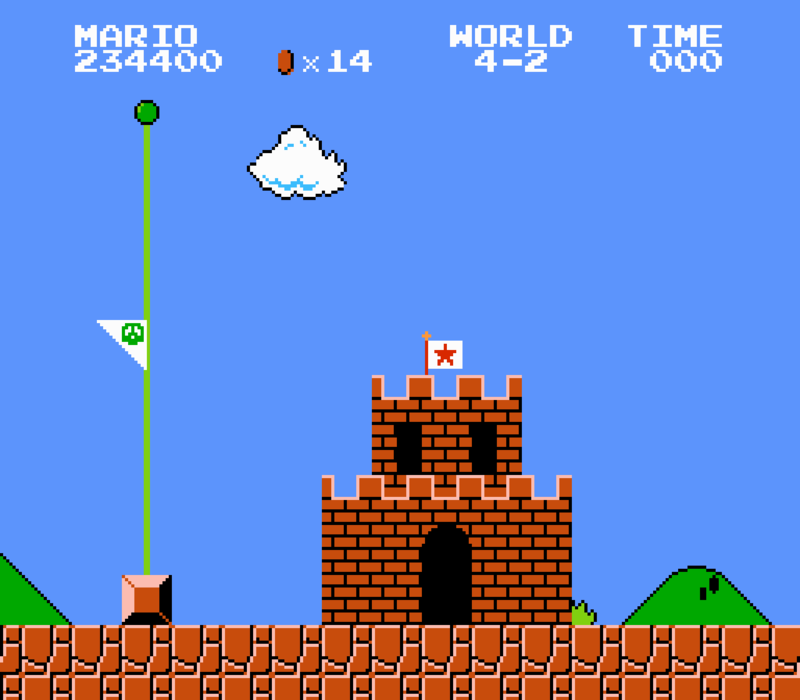 But long before even that, Satoru Iwata’s influence was making millions of gamers all over the world smile. When working at HAL Laboratory he produced the Kirby games, creating a much-loved Nintendo character in the process. Then he joined Nintendo and programmed the incredible Earthbound, still one of the finest RPGs ever made, and in the years followed was producer and eventually executive producer on countless Nintendo games. Even long after he became president and started focusing on the business side of Nintendo, Iwata’s love for the games themselves continued to shine through. His Iwata Asks interviews are an enormous treasure trove of retro stories and game design discussions, all of which clearly show his genuine enthusiasm for the subject matter. This was a man who cared so much about Nintendo that when the company announced a loss in 2014, he decided to slash his salary in half to do his bit. Satoru Iwata was a man who was never scared to take the piss out of himself if it made Nintendo fans smile. His legendary Nintendo Direct performances – in which among other things he stared at bananas, unboxed a Wii U with gloves on, engaged Reggie in a fight to the death and found himself surrounded by Luigis – were the stuff of meme gold. 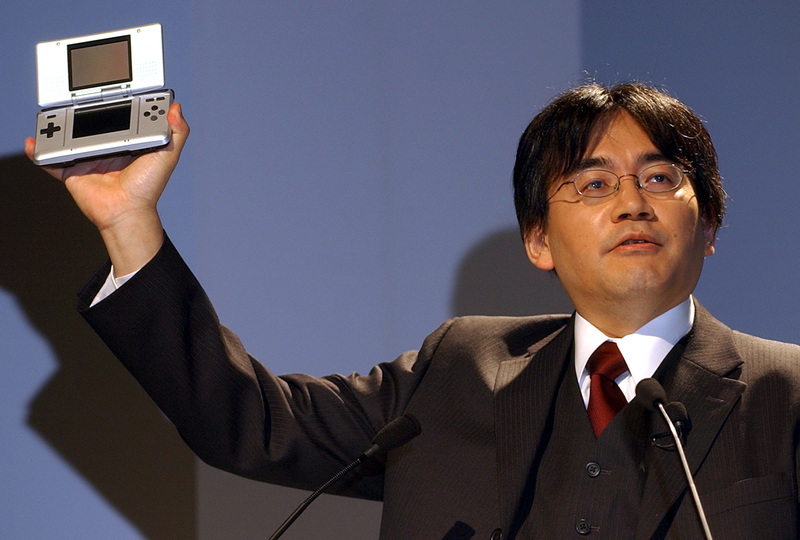 Iwata exuded a level of character and charm that other companies could only dream of replicating. To many the belief is that Sony and Microsoft are in it to make money while Nintendo are in it to make us smile. Iwata’s Nintendo Direct videos played a big part in forming that impression. Tonight I feel absolutely empty. Iwata’s health concerns were well documented: he skipped E3 2014 and the subsequent shareholders meeting to have surgery to have a growth removed from his bile duct. According to Nintendo, his death was caused by another growth that formed there. His physical appearance changed dramatically as he lost a great deal of weight following the surgery: similar to the way Steve Jobs’ weight drastically dropped in the months leading to his death. 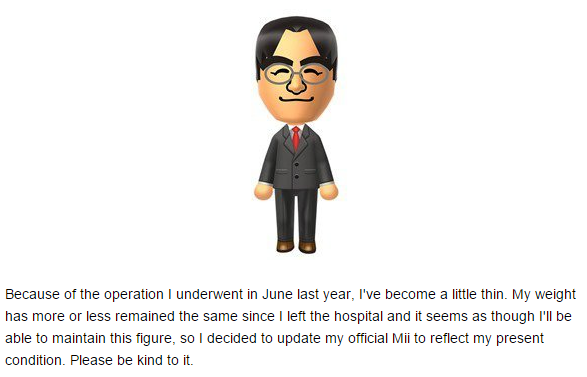 And, in typical Iwata style, just last month he changed his official Mii to replicate this, charmingly joking that we should go easy on this new-look character. In a way, because of what appeared to be cancer surgery and his subsequent extreme weight loss, we shouldn’t be shocked by what has now happened. But we are. Satoru Iwata wasn’t just a man, he was a company. His love for this industry and his passion for every product Nintendo makes meant that every time he appeared on a Nintendo Direct screen, you felt like it was Nintendo itself speaking to you, reminding you why you were a Nintendo fan. 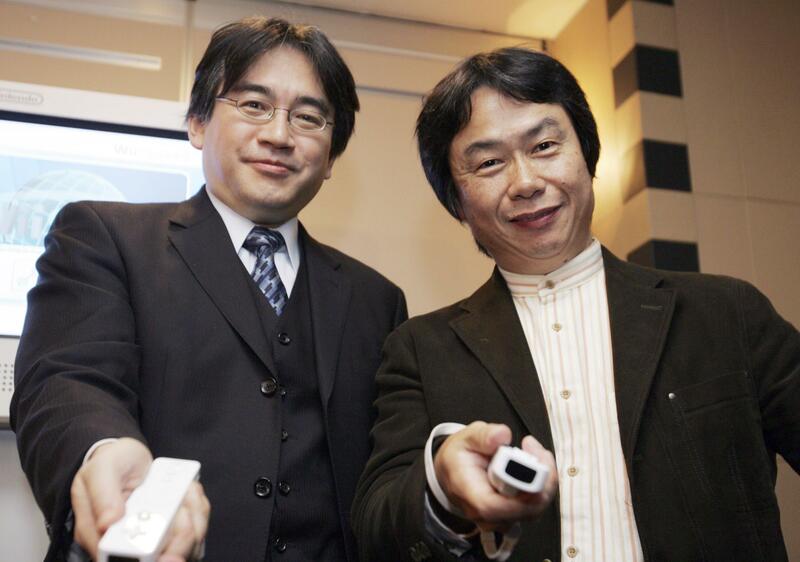 Shigeru Miyamoto and Genyo Takeda have taken over the running of Nintendo for now. Many expected Miyamoto to become the president eventually, but only when Iwata decided it was time to step down. Not like this. And so, although it felt like Iwata was Nintendo, the company has not died tonight. But an enormous part of it has. On a purely selfish basis, as a gamer, it’s heartbreaking to think Iwata will never get to see the next steps in Nintendo’s plan: its controversial embrace of mobile gaming and its subsequent NX system. But on a personal level, it’s infinitely more devastating that a man who helped bring so much joy, warmth and love into many millions of hearts around the world should be taken from us at only 55 years of age. 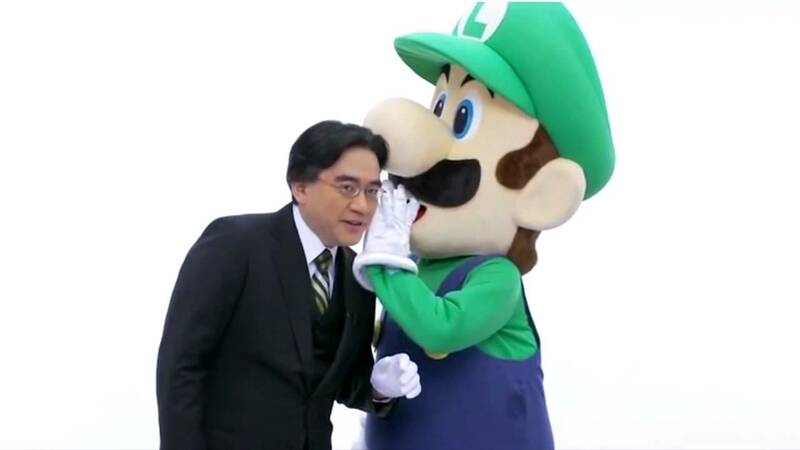 “Please understand,” Iwata would tell us any time a game was delayed. “Please understand.” He was so charming and apologetic when he said it that of course we understood. We even turned it into a little joke, saying “please understand” on Iwata’s behalf any time Nintendo did something wrong. But now he’s gone. At such a young age. And to think he still had so much to give, and that the world is now deprived of the smiles he had planned for us in the years to come… that’s something we’ll never understand. Nintendo roughly translates as “leave luck to Heaven”. Never has this been more appropriate, as Heaven is immensely lucky to have Satoru Iwata. One of my greatest regrets in life will now be that I did not thank Mr Iwata personally for his services in gaming. The news of his death is something I find hard to even comprehend because this man I never met had such an impact on my life through gaming. So well written and sums up what a large number of people are thinking. Iwata san grew to be my favourite personality in this industry. It is rare indeed that such a nice, decent and kind human being can rise to the top of a company and he will be remembered so fondly by so many. 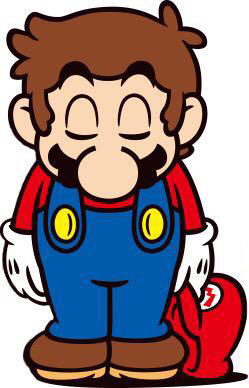 Rest well Iwata not many have touched so many on this Earth the way you have. I don’t think I can add anything to this. Please understand. Wonderfully written and very moving, a loving tribute to man who will be sorely missed and who’s impact will be forever remembered. Reblogged this on Main Gaming. Reblogged this on That's old muse.